Take a Quick Tour or Try it for Free! Streamline your business with online inventory and order management software! My Inventory Online is a web based inventory and order management system aimed at small and medium sized businesses which helps you manage your inventory, orders, customers, suppliers and much more. Try it today free of charge and with no obligations. Are you still overly reliant on complicated, slow spreadsheets and manually typing your invoices in Word? It's time to evolve! My Inventory Online gives you all the features of large, expensive inventory management solutions at a fraction of the cost and with no contracts. 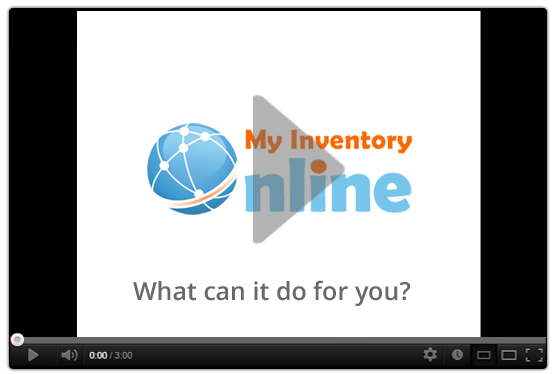 My Inventory Online is a web based system, allowing you to access your data from anywhere! We handle the complete maintenance and backup of your data, saving you the time and money involved in managing your own server. We also run on Windows and Mac! Why not try it for yourself? It only takes a few seconds to sign up and you don't need a credit card! Try it for Free! "It's a great system. I would definitely recommend it to others."